Xabi Alonso has been omitted from Real Sociedad's squad for a friendly on Wednesday, fuelling rumours he is on the verge of joining Liverpool. The Spanish club have already confirmed they have received an offer for the midfielder - thought to be £10.7m. And Sociedad also revealed they are willing to sell the player, who played twice at Euro 2004, at the right price. Alonso, 22, could replace midfielder Danny Murphy, who joined Charlton on Tuesday for £2.5m. 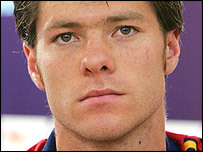 Alonso made his international debut in a 4-0 win against Ecuador last year. The central midfielder was unable to prevent Spain being eliminated by Portugal at the European Championship. Sociedad are thought to need to raise cash following the arrival of Mikel Arteta from Rangers during the summer.